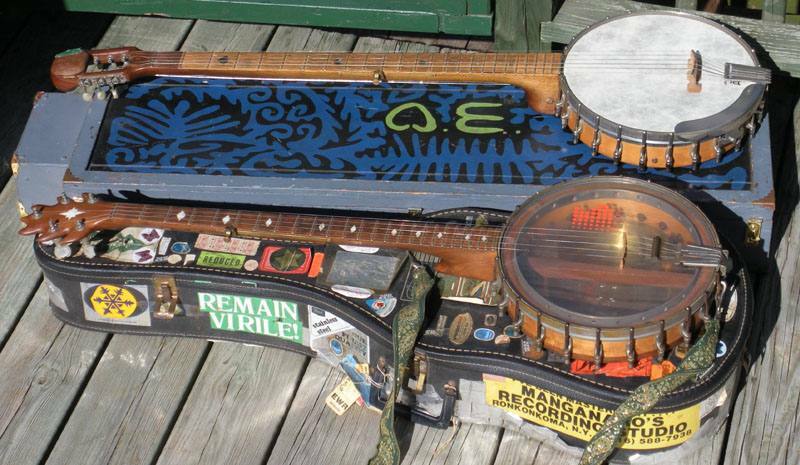 Above: Isillindë ("singing moon"), Banjo #3 and 1st normal one, more or less: a longneck with a 6th string between the 4th and 5th strings; the 5th string peg replaced by a permanent capo screw and a machine in the peghead; the pot is regular banjo hardware. The short walnut board I used for the neck made the bridge too close to the edge of the pot, choking the sound: I re-angled the neck to increase the volume, making the bridge almost an inch high, but it worked: big sound, amazing sustain. Originally the neck was one fret short of true longneck; when I replaced the peghead I added a fret. Then I strung two strings along the neck underside (that silver streak you see in the photo) for a tension rod, with their machines hidden in the pot. This also boosted the sustain. Abalone inlay in a thin maple fretboard. Fibreskyn head. Internal resonator: a 1955 Ford hubcap. Isil, my main axe, can be heard on Chilly Winds . Below: Archtop, banjo #6, made circa 1982 from a Paramount tenor banjo pot and my own neck with Atlantic scallop inlay. There is no separate fretboard: the frets are set in a solid piece of walnut. Clear mylar head; plastic pickguard recycled from some home stereo equipment. Mother of pearl inlay. The brown thing between the bridge and the tailpiece is a piece of rubber recycled from a dead billiards table, a sort of mute which purifies the tone. Internal resonator: a chrome-plated brass Chevy hubcap. I made, designed and painted Isil's case; the yellow-green shapes are A and K in Adamic, my own phonetic alphabet. Archtop lives in a small "soft" guitar case.